Tasty chunkies with chicken, cooked in oven and seasoned French-style. For cats of all breeds. Nutritive value and digestibility: high content in noble proteins and good vitamins integration, good digestibility. Perfume and agreeableness: delicious scents of meat with the typical intensity of the main ingredient. Composition: Meat and meat-by-products (of which chicken 12%), cereals, minerals. Analytical components: Moisture 80%, Raw Proteins 8%, Raw Fats 6%, Raw Fibres 0,8%, Raw Ashes 2,5%. 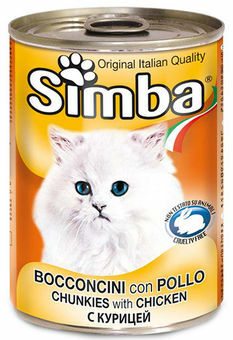 Instructions for use: For a medium size cat (3-4 kg), 400 grams of product shared in 2/3 meals. To be served at room temperature, or warmed. Keep in refrigerator after opening. Do not give the product too cold. Always leave fresh and clean water available to the animal.